On March 9, 1913, during our bloody victory over four thousand passé-ists in the Constanzi Theater of Rome, we were fist-and-cane-fighting in defense of your Futurist Music, performed by a powerful orchestra, when suddenly my intuitive mind conceived a new art that only your genius can create: the Art of Noises, logical consequence of your marvelous innovations. In antiquity, life was nothing but silence. Noise was really not born before the nineteenth century, with the advent of machinery. Today noise reigns supreme over human sensibility. For several centuries, life went on silently, or mutedly. The loudest noises were neither intense nor prolonged nor varied. In fact, nature is normally silent, except for storms, hurricanes, avalanches, cascades, and some exceptional telluric movements. This is why man was thoroughly amazed by the first sounds he obtained out of a hole in reeds or a stretched string. Primitive people attributed to sound a divine origin. It became surrounded with religious respect, and reserved for the priests, who thereby enriched their rites with a new mystery. Thus was developed the conception of sound as something apart, different from and independent of life. The result of this was music, a fantastic world superimposed on reality, an inviolable and sacred world. This hieratic atmosphere was bound to slow down the progress of music, so the other arts forged ahead and bypassed it. The Greeks, with their musical theory mathematically determined by Pythagoras, according to which only some consonant intervals were admitted, have limited the domain of music until now and made almost impossible the harmony they were unaware of. In the Middle Ages, music did progress through the development and modifications of the Greek tetrachord system. But people kept considering sound only in its unfolding through time, a narrow conception so persistent that we still find it in the very complex polyphonies of the Flemish composers. The chord did not yet exist; the development of the different parts was not subordinated to the chord that these parts could produce together; the conception of these parts was not vertical but merely horizontal. The need for and the search for the simultaneous union of different sounds (that is to say, of its complex, the chord), came gradually: the assonant common chord was followed by chords enriched with some random dissonances, to end up with the persistent and complicated dissonances of contemporary music. 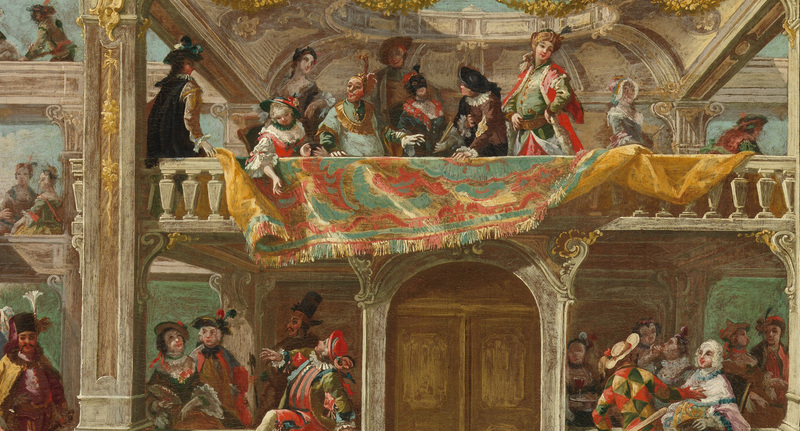 A Masked Ball in Bohemia (detail), attributed to Andreas Altomonte, c. 1748. © The Metropolitan Museum of Art, bequest of Mariana Griswold Van Rensselaer, 1934. First of all, musical art looked for the soft and limpid purity of sound. Then it amalgamated different sounds, intent on caressing the ear with suave harmonies. Nowadays musical art aims at the shrillest, strangest, and most dissonant amalgams of sound. Thus we are approaching noise-sound. This revolution of music is paralleled by the increasing proliferation of machinery sharing in human labor. In the pounding atmosphere of great cities as well as in the formerly silent countryside, machines create today such a large number of varied noises that pure sound, with its littleness and its monotony, now fails to arouse any emotion. This evolution toward noise-sound is only possible today. The ear of an eighteenth-century man never could have withstood the discordant intensity of some of the chords produced by our orchestras (whose performers are three times as numerous). On the other hand, our ears rejoice in it, for they are attuned to modern life, rich in all sorts of noises. But our ears, far from being satisfied, keep asking for bigger acoustic sensations. However, musical sound is too restricted in the variety and quality of its tones. The most complicated orchestra can be reduced to four or five categories of instruments with different sound tones: rubbed string instruments, pinched string instruments, metallic wind instruments, wooden wind instruments, and percussion instruments. Music marks time in this small circle and vainly tries to create a new variety of tones. We must break at all cost from this restrictive circle of pure sounds and conquer the infinite variety of noise-sounds. Each sound carries with it a nucleus of foreknown and foregone sensations predisposing the auditor to boredom, in spite of all the efforts of innovating composers. All of us have liked and enjoyed the harmonies of the great masters. For years, Beethoven and Wagner have deliciously shaken our hearts. Now we are fed up with them. This is why we get infinitely more pleasure imagining combinations of the sounds of trolleys, autos, and other vehicles, and loud crowds, than listening once more, for instance, to the heroic or pastoral symphonies. It is hardly possible to consider the enormous mobilization of energy that a modern orchestra represents without concluding that the acoustic results are pitiful. Is there anything more ridiculous in the world than twenty men slaving to increase the plaintive meowing of violins? This plain talk will make all music maniacs jump in their seats, which will stir up a bit the somnolent atmosphere of concert halls. Shall we visit one of them together? Let’s go inside one these hospitals for anemic sounds. See, the first bar is dripping with boredom stemming from familiarity, and gives you a foretaste of the boredom that will drip from the next bar. In this fashion we sip from bar to bar two or three sorts of boredom and keep waiting for the extraordinary sensation that will never materialize. Meanwhile, we witness the brewing of a heartrending mixture composed of the monotony of the sensations and the stupid and religious swooning of the audience, drunk on experiencing for the thousandth time, with almost Buddhist patience, with elegant and fashionable ecstasy. Pouah! Let’s get out quickly, for I can’t repress much longer the intense desire to create a true musical reality finally by distributing big loud slaps right and left, stepping and pushing over violins and pianos, bassoons and moaning organs! Let’s go out! Let’s walk together through a great modern capital, with the ear more attentive than the eye, and we will vary the pleasures of our sensibilities by distinguishing among the gurglings of water, air, and gas inside metallic pipes, the rumblings and rattlings of engines breathing with obvious animal spirits, the rising and falling of pistons, the stridency of mechanical saws, the loud jumping of trolleys on their rails, the snapping of whips, the whipping of flags. We will have fun imagining our orchestration of department stores’ sliding doors, the hubbub of the crowds, the different roars of railroad stations, iron foundries, textile mills, printing houses, power plants, and subways. My dear Pratella, I submit to your futurist genius these new ideas, and I invite you to discuss them with me. I am not a musician, so that I have no acoustic preferences, nor works to defend. I am a futurist painter who projects on a profoundly loved art his will to renew everything. This is why, bolder than the boldest professional musician, totally unpreoccupied with my apparent incompetence, knowing that audacity gives all prerogatives and all possibilities, I have conceived the renovation of music though the Art of Noise. From The Art of Noise. Though a prominent futurist painter in his day, Russolo remains best known for this manifesto. The same year he sent it to the composer Pratella, Russolo intro­duced his intonarumori, a set of noise instruments in the form of black boxes with horns in the front. A performer would turn a crank or push a button to initiate an acoustic noise generator inside; pitch was controlled by a lever on top. None of the instruments survived World War II.